January 2018 Fat, Sugar and Salt are three addictive substances that many of us have spent the past 22 days pretending to avoid, but artist Dale Lewis insists that in the beige-coloured form of a steady stream of McDonalds meals, fat, sugar and salt kept him going during the 12 hour days he spent in the studio in the lead up to his new show. 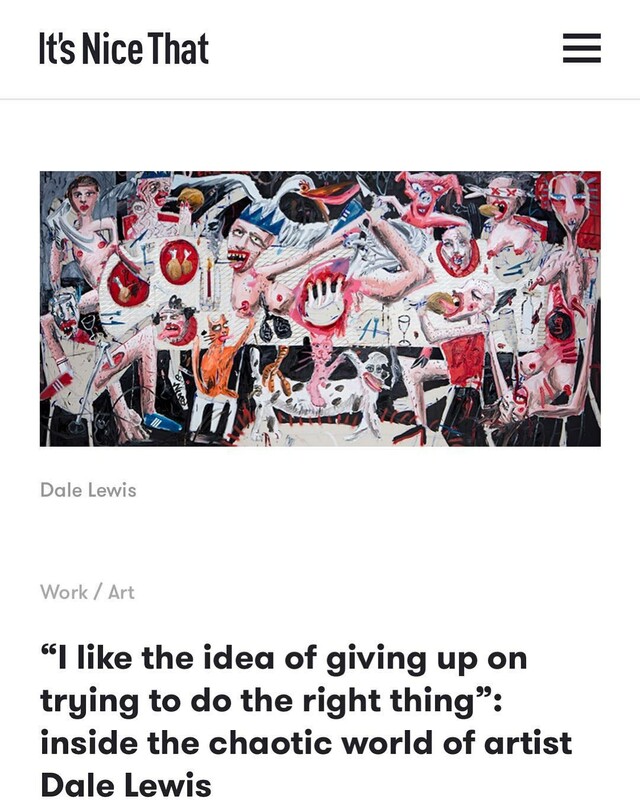 Fat, Sugar, Salt is Dale’s second solo show, and continues the former Jerwood Painting Fellowship winner’s burrow into the deprivation around his home in east London. Borrowing from Renaissance and religious paintings as inspiration, Dale regurgitates chaotic, often violent scenes witnessed in his local community from memory onto sprawling canvases. Where did you grow up, and how did you first find your way into painting? I grew up in a post war, industrial working class town called Harlow in Essex. It was designed by Sir Frederick Gibberd who was also responsible for the metropolitan cathedral in Liverpool and Regent’s Park mosque. It was a great vision at the time. My grandparents after being bombed out / evacuees from London during the war moved there. Harlow was a great vision. Well designed.. it was thought that everybody would ride bicycles, live in estates and have strong community relationships with one another. The reality of the town despite being very green and safe didn’t really work. It became known as pram town full of teen pregnancies. Henry Moore was commissioned to make the sculpture family group 1954 that was to be the emblem of the town.This incredible work which i’d see regularly as a kid being pushed around the streets in a buggy by my mother had a huge influence me. There were also other sculptures dotted around the town including Rodin’s Eve, Frink’s Boar and Meat Porters by Ralph Brown. The Brown sculpture terrified me — in a good way. I never went to play school so spent the first five years of my life hanging out with my Nan. We would potter around in the garden. Have lunch together, press flowers… She would give me some paper and pencils and while she was ironing or doing general household chores I’d draw. I could never think of anything to draw and would ask her for some inspiration. And she would reply, “just draw what is in front of you”. It’s still pretty much what I’m doing today. So there were endless drawings of my nan’s dog, who i taught to walk down the stairs, drawings of my nan doing the ironing or fruit / flowers / tea cups on the table. I’d also take cuttings from the garden and draw small branches or flowers like the Victorian style botanical plates in books. They also had a small collection of books by Picasso, I’d flick through those and copy the paintings. My Auntie at the time used to make wedding dresses and had a tiny studio in my grandparents house. I used to love hanging out in there and making creations out of scraps of material. I was really obsessed with Grace Jones at the time and used to make hats inspired by what I thought she would like to wear. My best creation as a tribute to her was a very tall top hat (without a rim) with a coat hanger through it and covered in purple velvet and ribbon. I remember wearing it around the house for days. I was very lucky as a kid and encouraged to play in a creative way. By the time I was in school it was clear I wasn’t going to be great academically, being dyslexic I struggled with reading and writing, which gave me more time to focus on art and cooking. Can you talk us through the thought behind your distinctive title "Fat, Sugar, Salt”? I don’t give the titles too much thought. The show has to be called something and I let the title come naturally. While I was making the work for the show I was spending 12 hours a day in the studio. My diet was terrible, there are very little places to get “healthy” food around the studio so most meals came from McDonald’s. I was also smoking loads and drinking a lot of alcohol. I didn’t think about it much at the time as getting the paintings made was the most important thing. Now the show is up, I can eat a few vegetables and cut back on the devil’s juice. The title I guess was also poking fun government warnings. We’re always being warned or made to feel guilty about having what we want / crave. Art is about freedom and individuality and indulgence. And really about living in the moment. I’ll take whatever I like today. I don’t really think about what i’d want tomorrow. When I have a stroke or heart attack or get diagnosed with cancer, so be it. At least (I hope) I left behind a couple of good paintings. Tell us about the characters you depict. The characters are ordinary people I see in and around London. I love seeing all different types of people in different clothing, whether it’s for fashion or religious or ceremonial purposes. I don’t really think there’s anywhere quite like this city. It makes being a figurative painter quite easy. If I still lived in Harlow I guess most of the people would be white working class and it would be tiring quite quickly. In London you only have to take a walk, a bus or a tube journey and you’ve seen a whole host of people and scenarios that could make it into a painting. For all London’s glistening luxury flats and exclusive members clubs, the scenarios you choose to paint speak of a city filled with violence and deprivation. Why? I guess it’s what I identify with most. I live in an area of London that’s pretty filthy, with low living standards. And I feel comfortable here. There are people drinking all day on benches, there’s rubbish everywhere, daily dumped fridges and mattresses, 24 hour off licences and endless fried chicken shops, pizza takeaways and kebabarys. I see people in wheelchairs everyday outside Wetherspoons where I often stop for breakfast. I see people downing pints at 9am. There’s a man I see regularly walking slowly with a mobile oxygen tank with a cute dog. I like seeing people doing nothing all day. Or the bare minimum… No ambition and no future. Around the festive period is a great time to observe binge drinking. You can see office girls crawling around the floor at Liverpool Street station trying to get back to the suburbs. Men in suits passed out on the tube with vomit down themselves. I love to see that… That abandonment of composure. I like the idea of giving up on trying to do the right thing. When most of the time things are wrong and far from perfect. That’s how I like to leave the paintings. Harsh, surreal, and often grotesque, what kind of response does your work tend to generate? So far I think the reception has been pretty positive. I hope people can identify with the work and see beyond the surface. Read the paintings in a more formal way instead of just identifying the narrative on the surface that informs them, but it doesn’t really matter if they do or don’t. It’s also great to have such a large show in London after doing so much abroad the last couple of years. I was really anxious about how it would look and when it was up stopped worrying about it. I’m really hard on myself and aware of how much fretting, sweating, blood, hours and tears go into my practise. A good painter in their studio should know if they’ve given it all they can, or cut a few corners. I don’t think I have. There are a few people I love and trust who’ve seen the work develop over the last few years and they were very complimentary. They would tell me otherwise. And thats makes me feel like it’s all good for now. Of course, there’s always a lot more work to be done. Fat, Sugar, Salt is now open at Edel Assanti through 10th March.